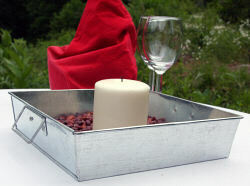 These charming metal galvanized trays would be a great addition to nearly any home décor. Can be used as a food server, or to carry eating utensils from the kitchen to the dining room or outside to a BBQ. Also works wonderfully to organize small home items or for storage uses. Would make a great centerpiece item at a party or event.